The new guy at Tracy's school is handsome, intense, and desperately needs her help--but there's something about him that isn't quite right. High school junior Tracy Lloyd is unsure about the new guy in school. Brad Johnson is attractive, smart, and polite, but Tracy can't help but feel he watches her too closely. Then one day Brad confides in Tracy a horrible secret: His little sister Mindy has been kidnapped by his stepfather, and he needs Tracy's help to get her back. But even as Tracy commits to a plan to help her vulnerable new friend, details emerge that suggest nothing is what it seems. The Twisted Window is a zigzagging thriller that keeps readers guessing up until the final page. 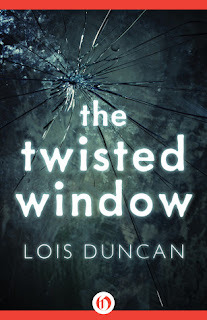 The Twisted Window is a shockingly realistic suspense novel that piques curiosity. Lois Duncan weaves a simple web of mystery that unravels quickly and surely. Duncan's way with words forces you to read between the lines, and while this may make it easier to predict events in the plot, the story still has an element of surprise. Duncan's writing style will lead you to create assumptions about the characters and their motivations. The fun comes from learning whether your predictions are right or wrong and how they play out in the story. The Twisted Window is the kind of story that's serious and quick, but still meaningful enough to give you something to think about. The ending is nicely constructed, open-ended and subject to reader interpretation. It's a conclusion you'll either love or hate, but being able to imagine what might happen next keeps the suspense flowing even after the end. The biography added to this ebook version of The Twisted Window was very much appreciated. Being able to learn about the author with pictures of her family was interesting. Lois Duncan is not only an amazing writer, but a great influence to aspiring authors. I love books that let you make your assumptions and then you have to find out if they were right or wrong, it makes me feel like I'm there with the characters and that i'm part of the story. This book is not exactly what I use to read, but it sounds pretty fascinating for what you said in your review, so I may be giving it a chance. Thank you for your thoughts about the writing of this book. It looks like something I would like and I'm planning to add it to my to-read list. I'm really curious how it unfolds now.